-ad in Erie Daily Times, Wednesday, May 12, 1948 for Sears at 134 East 10th St., Erie, PA.
-ad in Erie Dispatch, Sat., May 8, 1948. 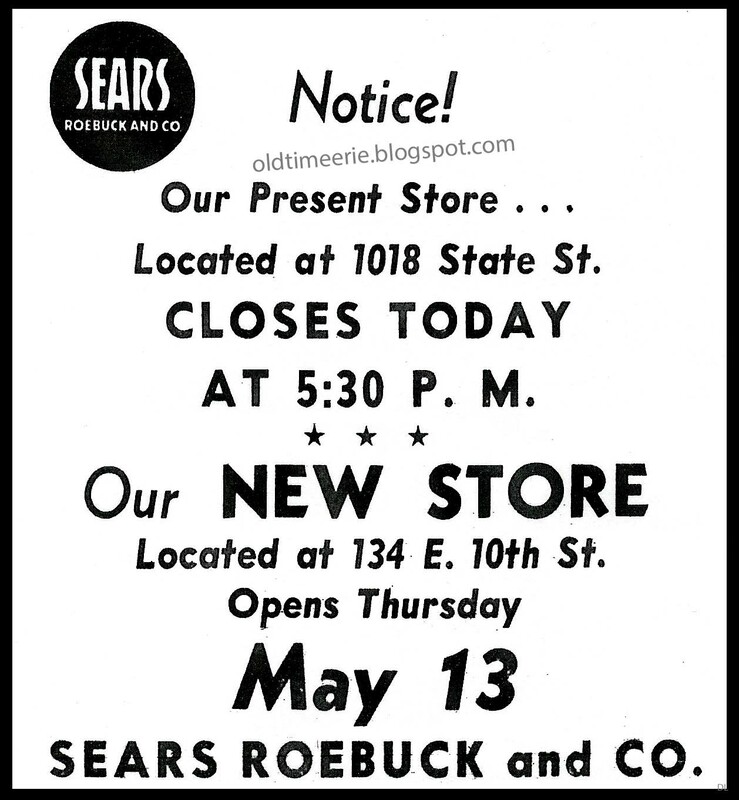 The new Sears Roebuck and Co. retail store opened for business at 134 East 10th St. in Erie, PA on May 13, 1948. Sears moved from its old location at 1018 State Street into a much larger brand new building. No need to pump the meter full of nickels and...the Tenth Street location had plenty of free parking. 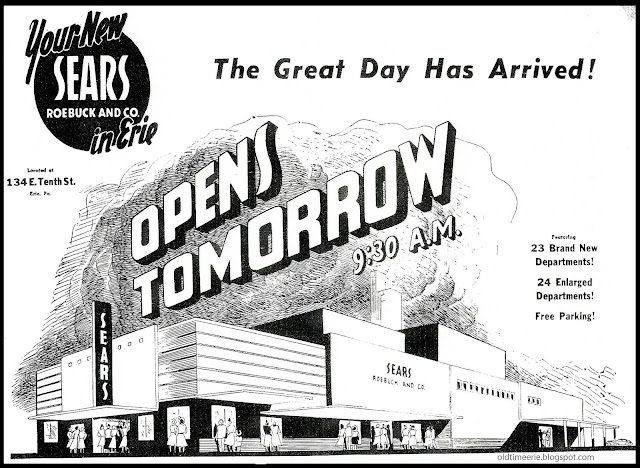 In addition to 24 newly enlarged departments, Sears now had 23 brand new departments. The old store did not carry clothing; it was featured prominently on the first floor of the new bldg. A farm store filled most of the basement. Sears hoped to get away from catalog orders and have stock on hand for customers, leading to more impulse purchases and increased sales. Sears increased its staff from 100 people at 1018 State Street to about 350 employees on Tenth Street. It is not known how many people worked at the original Sears retail store at 1612 State Street in the late twenties. 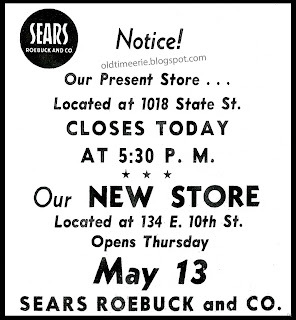 Sears moved to the Millcreek Mall around 1975 and the old building at 134 E. 10th Street was later demolished. The site is now Jerry Uht Park, the home of the Erie Seawolves, the Double-A affiliate of the Detroit Tigers baseball team. Construction started on the Uht in 1994. Labels: 1018 State St, 134 East 10th St, East Tenth St, Erie PA, Erie Seawolves, Jerry Uht Park, Sears, Sears Roebuck Co. 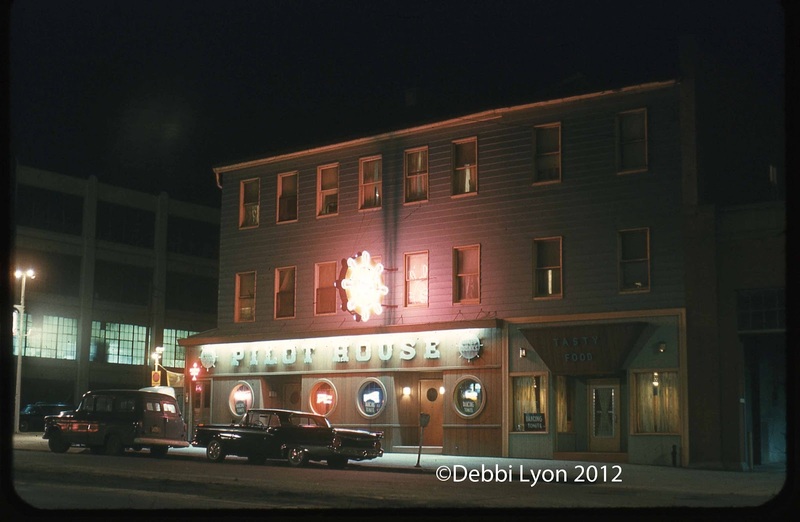 Pilot House, 3rd & State St., Erie, PA. Photo by Chester Wasielewski.©Debbi Lyon 2012. -ad in Erie Daily Times, January 18, 1963. 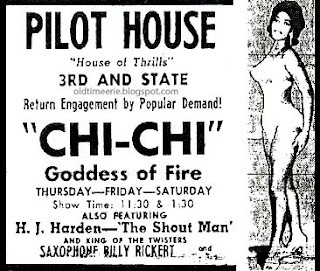 Stop by the Pilot House, the 'House of Thrills' at 3rd & State Street in Erie, PA for the return engagement of Chi-Chi, Goddess of Fire. If Chi-Chi is too hot for you, check out H. J. 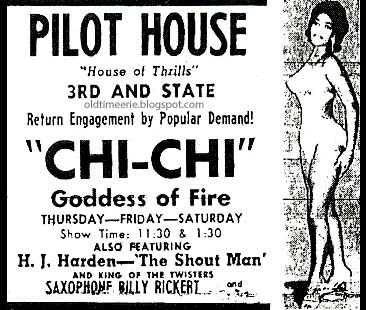 Harden, 'The Shout Man' and King of the Twisters, or Saxophone Billy Rickert. Buggin' State Street? The Pilot House is another in a long list of buildings in downtown Erie that don't exist anymore. The Diamond National Building (300 State St.), visible on the left side of the photo above, still stands. -ad in Erie Daily Times, February 12, 1970. 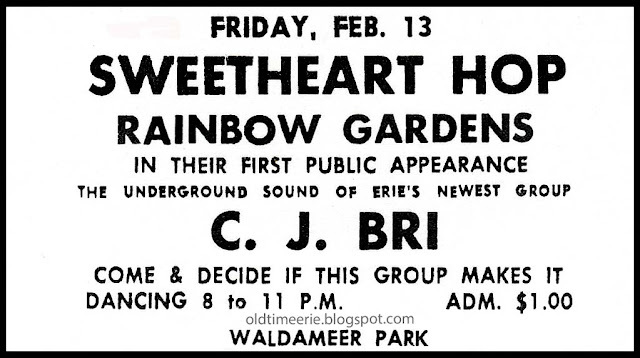 Check out this ad for the first public appearance of C. J. Bri, a progressive trio featuring Jon Ims, organist John Novello and drummer Jay Lewis (ala Emerson, Lake & Palmer). The band played the Sweetheart Hop at Rainbow Gardens at Waldameer Park on Friday the 13th of February, 1970. Love how the ad says, "Come & decide if this group makes it." Only in Erie, PA! Novello formed C. J. Bri after the demise of Symon Grace and the Tuesday Blues. He has had a long career in the music industry as an author, composer, producer, music educator and and keyboardist (he plays in Niacin with bassist Billy Sheehan). Jon Ims wrote the Trisha Yearwood hit "She's In Love With the Boy." 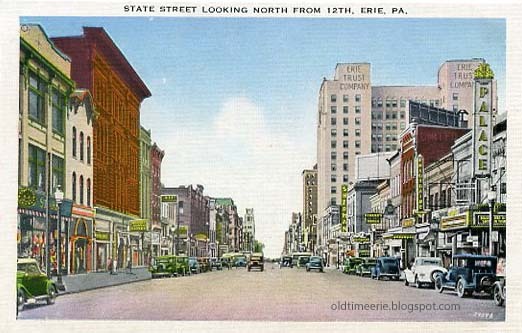 Turnpike Street ©1950 Nirenstein's National Realty Map Co.
Two recent articles on Old Time Erie discussed businesses on 14th and State Street in Erie, PA. The most recent showed a photo of the Wilson House/New Wilson Hotel on the triangle of 14th, State and Turnpike St. http://oldtimeerie.blogspot.com/2012/08/wilson-hotel-west-14th-and-state-1910.html A few readers remembered a gas station at this spot in the fifties, and lo and behold, they were right! At some point prior to 1956, the old hotel was demolished and replaced with a filling station. Raeder's Central Esso (Paul Raeder) operated at 1330 State St. in 1956. Raid's Central Esso (James F. Raid) was there in 1957. And Rapp's Central Esso (John Rapp) was there in 1959. The map above shows the owner of the property and the name of the business which occupied the building. For example, Charles Kline owned 1302 and 1304 State Street. 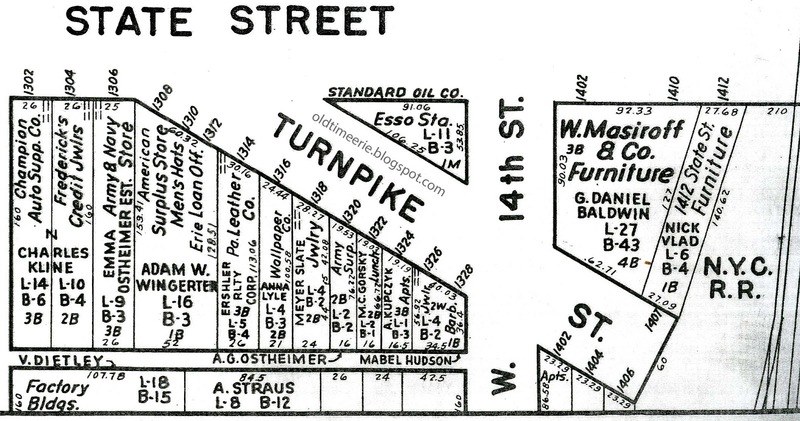 Champion Auto Supply Company had a store at 1302 State, and Frederick's Credit Jewelers had a store at 1304 State St.
Turnpike Street no longer exists between State Street and the north side of West 14th St.; the block has resumed a triangular shape. 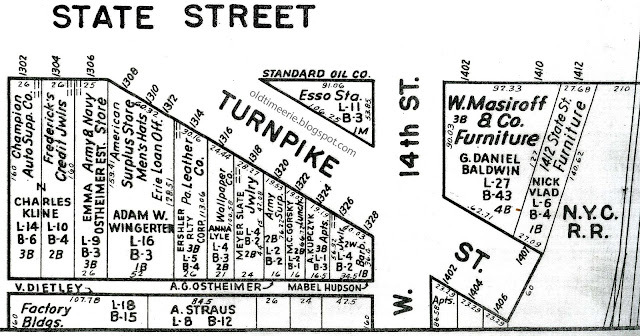 There is still a small portion of Turnpike St. behind the building at 1402 State St. in Erie, Pennsylvania. Wilson House on West 14th and State St. from 1913 Official Perry Centennial Souvenir Book of Erie. The Wilson House was owned by John Stinson in 1904. Florence Stinson and Oscar K. Stinson boarded at the Wilson House in 1904. The Wilson House had a name change at some point, and by 1914 it was known as the New Wilson Hotel. Frank G. Young was the proprietor of the New Wilson Hotel in 1914, and Robert B. Porter was its manager. The trolley tracks ran down the middle of State Street and are visible on the left side of the picture. Saint Benedict Academy (SBA), Erie's first private academy for girls, opened its doors in 1869. This school was in existence for nearly 119 years and was run by the Catholic Diocese of Erie, PA.
St. Ben's was located at 330 East 10th St., to the east of St. Mary's grade school, and around the block from St. Mary's Catholic Church. The final SBA class graduated in 1988. Sr. Annette Marshall was the principal and there were 13 lay teachers and seven Benedictine Sisters of Erie. 241 girls attended SBA in its final year. The school colors were navy and white. 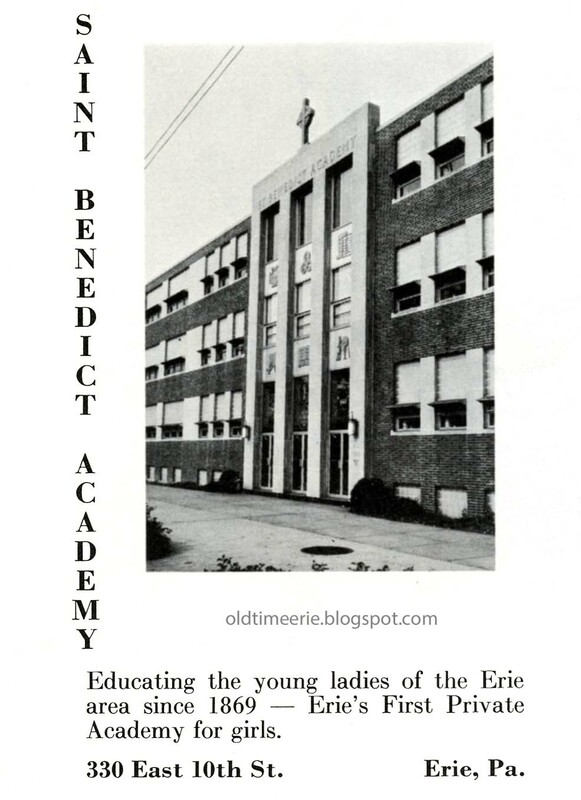 The new St. Ben's Academy was dedicated Dec. 8, 1955. The SBA basketball team was District 10 AA champs in 1980. "St. Ben's was a great high school," said Cherie DeMichele. "It changed our lives in that the teachers we had were Benedictines, and they stressed caring about the oppressed and getting involved in protests, marches, etc. We volunteered to see what it was like to only have a cup of rice to eat a day, we wrote letters asking the government to ban the B-1 bomber, we wore Huelga! buttons and got involved in the UFW strike and supported Cesar Chavez, etc. I was in the class of '78 but they closed in '88 or '89. I miss that school. We had more than an English and math education there. We had a social justice education. I am still very active in social justice issues to this day." 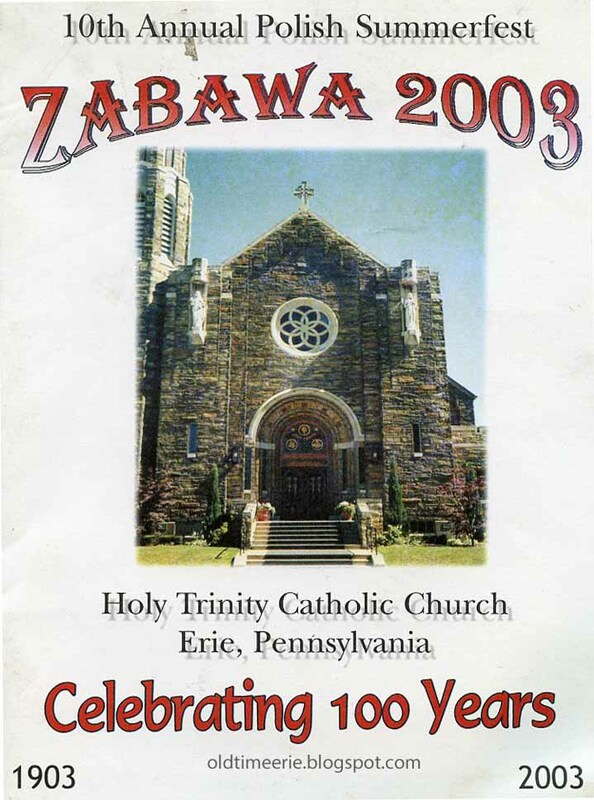 Holy Trinity Catholic Church has celebrated its Polish heritage in a big way every summer, throwing a three-day festival called Zabawa, which began in 1993. Zabawa spans the entire campus of the church, from East 22nd to East 23rd. The church itself borders Reed Street, and the auditorium is on 23rd St. Polka music blares almost non-stop either from live bands or from a disc jockey. A wood dance floor set on E. 23rd and Reed is a big draw, as is the food, which usually includes bigos (sausage and cabbage), golabki (cabbage roll), pierogi z serum (pierogi with cheese), czarina (duck soup), zrazy zawijane (sirloin with sausage, bacon and pickle wrapped inside), kotlet mielony (Swiss steak pattie) and kartoflane placki (potato pancakes). Sweets include bread, cookies, cakes, pies and paczki (Polish donuts). Holy Trinity's parish built its own church at 2220 Reed Street in the winter of 1903 and is part of the Catholic Diocese of Erie, PA. 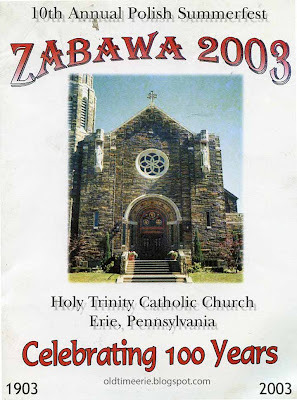 The 20th Annual Zabawa takes place August 23, 24 & 25, 2013 at Holy Trinity Parish on 23rd and Reed Streets. For more information, check the Holy Trinity RC Church website. 901 State St., Erie PA from 1913 Official Perry Centennial Souvenir Book of Erie. Here is a shot of a building that still stands on the southeast corner of 9th and State in Erie, PA. 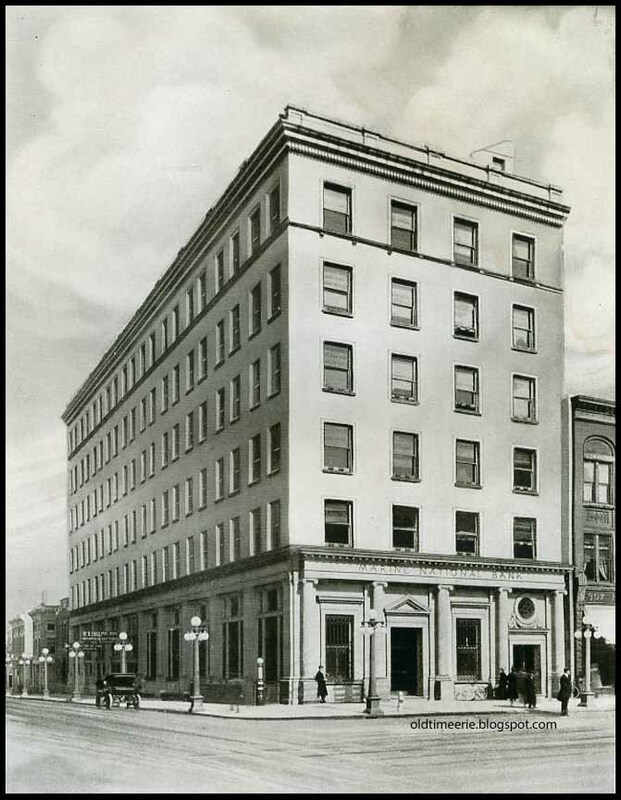 The Marine National Bank occupied 901 State Street when this photo was taken around 1913. The building is said to have been constructed around 1911. I wonder how many millions of dollars have passed through these front doors. Officers of Marine National Bank in 1922 included W. E. Beckwith, President, H. L. Moore, Vice President, C. G. Strickland, 2nd Vice President, W. E. Rindernecht, Cashier, Lylte L. Salsbury and George A. Gibson, Assistant Cashiers. Trask's was across the street on the northeast corner of E. 9th and State, and the Warner Theatre was a half-a-block to the north on the same side of the street. PNC Bank currently occupies this building. 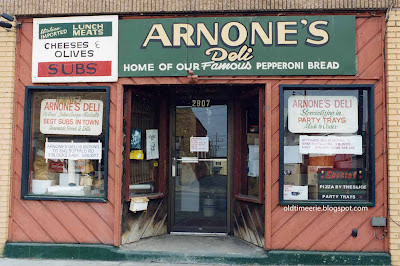 Arnone's Deli at 2907 Buffalo Rd. Photo ©Debbi Lyon 2012. Johnny Arnone had a store at 2907 Buffalo Road in Wesleyville, PA. Since it was right next door to where I worked, I'd pop in occasionally for some lunch meat. "Try this...try some of this," said Johnny Arnone, owner of the deli. He insisted that I was too skinny and was always trying to give me free food. The store at 2907 Buffalo Road was torn down to make way for the new Country Fair store. 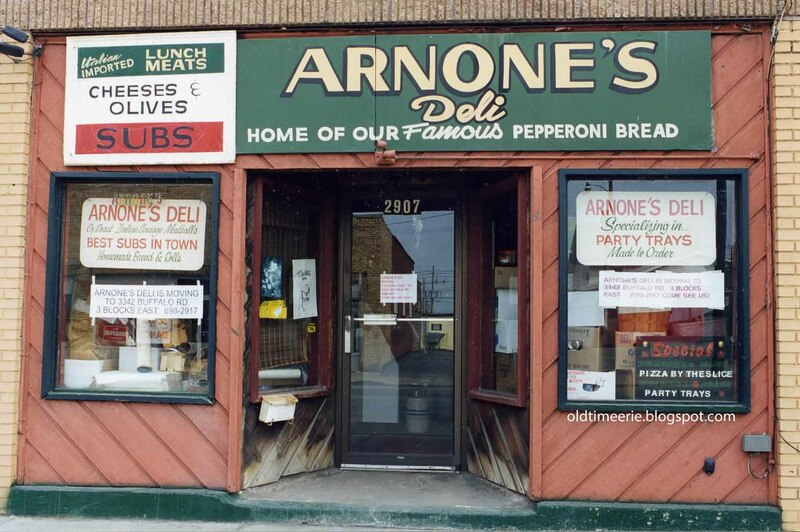 Arnone's Deli moved to 3342 Buffalo Rd. Johnny and his wife have both passed away. Their son John Jr. runs the deli at the corner of Buffalo Road and Center Street in Wesleyville, PA.
-ad in Erie Daily Times, February 27, 1891. Another weird Erie ad. This one cracked me up. "If you are in need of Gents' Fine Scarlet and Natural Wool Medicated Underwear. Call and examine our line. Daniel Illig, 1106 State St. A new line of Mackintoshes and Umbrellas just received." What the heck are fine scarlet and natural wool medicated underwear? -ad in Erie Dispatch, May 6, 1948. The smell of hot, roasted nuts has wafted from the corner of Tenth and State Street in Erie, PA for over 60 years. Several generations of kids have seen the Planters Peanut mascot, Mr. Peanut, complete with a monocle, a top hat and a cane, pacing in front of the Baldwin Bldg (now the Renaissance Centre), advertising the store. The Peanut Store moved to its new location in the spring of 1948. 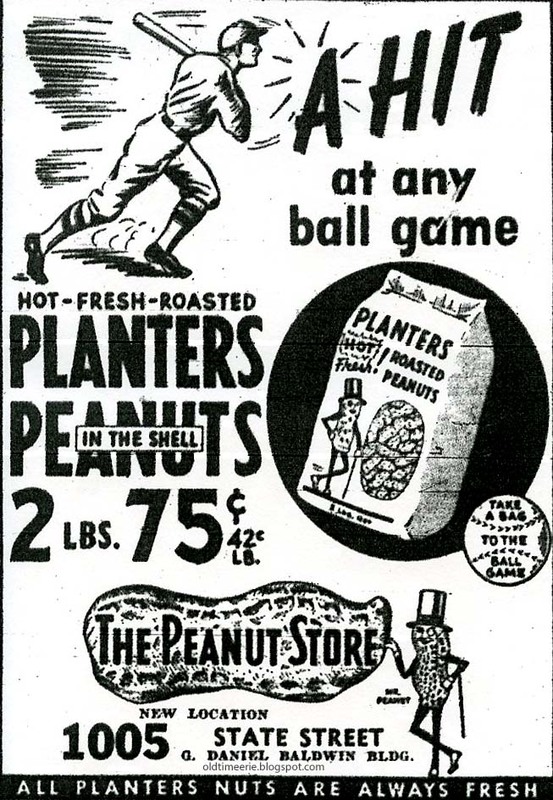 At that time peanuts in the shell sold for 42¢ a pound, or 2 pounds for 75¢. At some point, the Peanut Store changed owners and became the Peanut Shop. The Peanut Shop currently occupies the northwest corner of the first floor of the Renaissance Centre at 1001 State St. Annie Linebach has owned the Peanut Shop for more than thirty years. Her store is decorated with a number of old-time peanut items. -ad in Erie Dispatch, July 28, 1950. 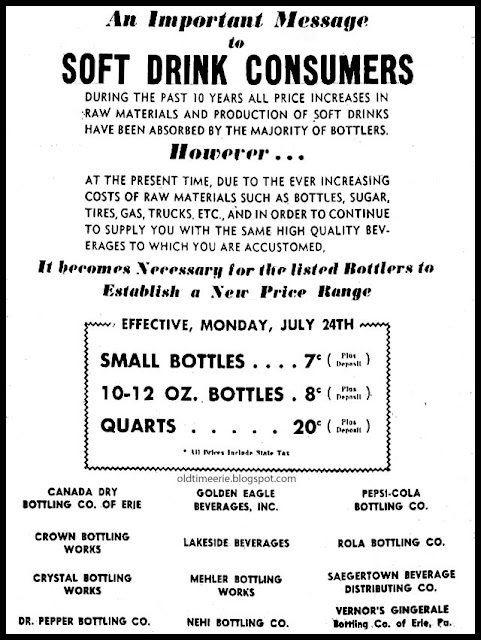 There were a number of pop bottling companies on Erie's east side, and a few on the westside, in 1950. 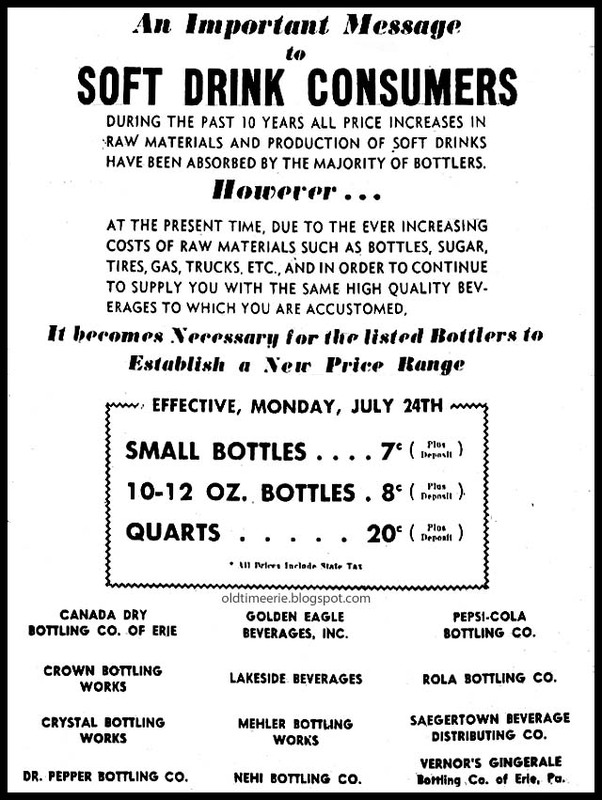 Hard to believe that a twelve ounce bottle of pop (or soda for you non-Erieites) was only 8¢. As an added bonus, kids could go around a find a few empty pop bottles, take them to the corner store, and earn enough money to buy a candy bar. Soft drinks had their own reward. Some of these bottles are considered collector's items today. Check antique stores and eBay and you'll see what I mean. Crystal Bottling Works, 501 Ash St.
Dr. Pepper Bottling Co., 1154 West 8th St.
Golden Eagle Beverages, Inc., 1825 Parade St.
Mehler Bottling Works, 1218 Parade St.
Nehi Bottling Co., 1710 French St.
Rola Bottling Co., 341 East 3rd St. Here's an ad for Rola Cola: an advertisement for Rola Cola. Photo by Chester Wasielewski. ©Debbi Lyon 2012. The Tire King stood guard at 2401 West 12th Street in Millcreek Township. 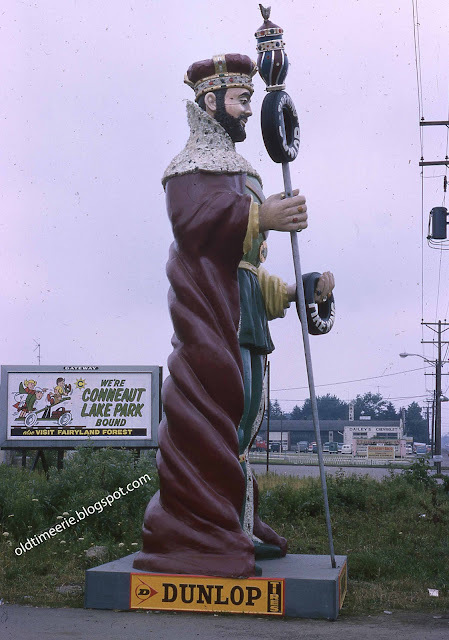 It was the mascot for Erie Tire King, Inc. around 1964. This scene was taken on West 12th Street looking west. If you stand in front of NAPA Auto Parts and look towards Dunn Tire you would be in the approximate spot. Kuharsky Bros Inc Gunsmith was located at 2425 West 12th when this picture was taken. 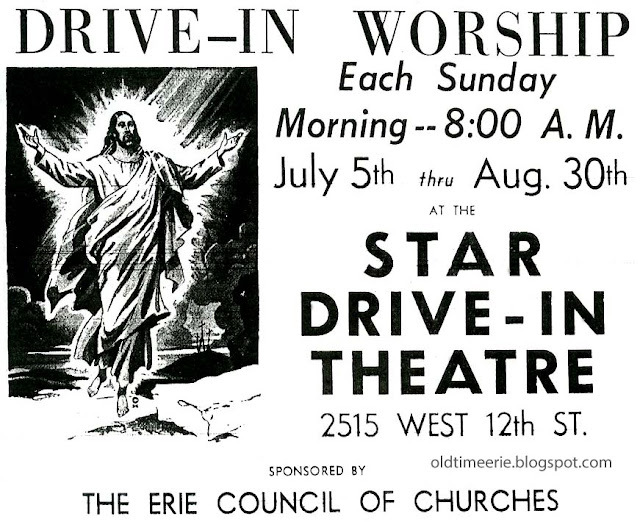 Next we have the Star Drive-In Theatre at 2515 West 12th. Finally, the Dailey's Chevrolet, Inc branch at 2519 West 12th Street (its main location was 1925 State St. in Erie). These businesses, if they still existed, would be across the street from the current Bob Evans Restaurant. There's also a nice Conneaut Lake Park billboard on the left advertising Fairyland Forest. I wonder if the Tire King met the wrecking ball. Baker's Bakery, 118 East 17th St.
Balkan Bakery Company 258 East 2nd St.
Bill's Bakery, 1825 West 26th St.
Boll's Bakery, 1136 East Lake Rd. Boll's Pastry Shoppe, 1912 East 38th St.
Colonial Bakery, 3717 Pine Ave.
Dolly Madison Cakes, 2440 Buffalo Rd. Firch Baking Company, 1902 Cranberry St.
Frontier Cake Shop, 1650 West 8th St. and 1625 West 26th St.
George's Bakery, 424 East 3rd St.
W.T. Grant Co. Bakery, 18 West 9th St.
H & K Do-Nut Shop, 3712 West Lake Rd. Haft's Bakery, 915 East Ave.
Omar Hall Baking Co., 1563 West 38th St.
Hess Avenue Bakery, 701 Hess Ave.
International Bakery, 610 West 18th St.
Kuneman's Bakery, 2646 West 8th St.
Lakewood Pastry Shoppe, 3433 West Lake Rd. Lucas Pastries, 1001 West 8th St. Majestic Baking Co., 1501 Walnut St.
Marque's Bread, 1140 East 20th St.
Morgan Bakery, 1061 West 22nd St.
National Biscuit Co., 2222 East 30th St.
Sontheimer Bakery, 561 West 31st St.
Ward Baking Co., 1540 West 26th St.
Washington Bakery, 1258 West 8th St.
Williams' Pie Kitchen, 1163 West 26th St.
Zehe Bakery, 121 East 21st St.
International Bakery and H&K Doughnuts are still in business. Jack Frost Doughnuts will reopen in the summer of 2012. The Frontier Cake Shop sold old fashioned German soft pretzels. Kuneman's had been in business since 1919 and was known for their wedding cakes. Labels: Colonial Bakery, Erie bakeries, Erie PA bakeries, International Bakery, Majestic Bakery, Paramount Pasteries, Sontheimer Bakery, Wesleyville Bakery. -ad in Erie Dispatch, June 23, 1909. Ever drive past or go to a show at Jr's Last Laugh and wonder what used to be in that giant building on the corner of 14th and State St.? Reliable Home Furnishing Company had the grand opening for this store in Erie, PA on June 23, 1909. The building has an unusual shape because its western border follows Turnpike Street. You could buy a variety of items at Reliable, including carpets, stoves, rugs and draperies. The store advertised one price, cash or credit. Demuling's Orchestra played at the grand opening, and the store passed out free souvenirs all day long. 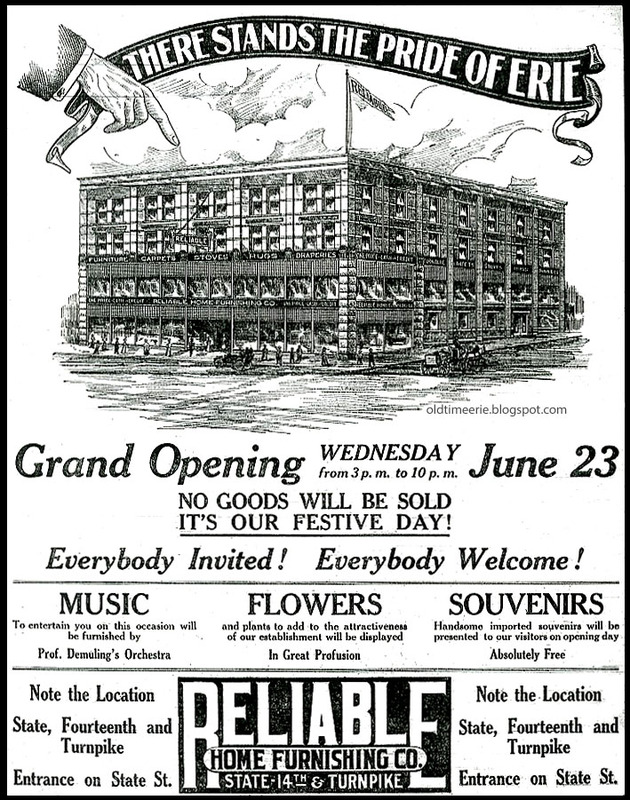 Abe Daneman was treasurer of Reliable Home Furnishing in 1922; Louis Grad was the manager. Furnitureland, owned by Greg Gardner, occupied the building after Masiroff's. Steve McGarvey renovated the building that now houses Junior's Last Laugh. This is right across the street from the old Mercantile Building at 1401 State St., a property that was under development by McGarvey at the time of his death in 2005. Musician/producer Keith Veshecco passed away in his home in Millcreek Township, Erie Co., PA on August 18, 2012. I interviewed Keith for an article called "A Musician's Guide to Local Recording Studios," which was published in the Erie Times-News tab Showcase on June 21, 1990. When Keith Veschecco and his partner, John Mazza, opened Twang Recording Studio (T.R.S.) in 1977, it was to record their own band, Twang. Soon, however, the monthly loan payment for the equipment loomed over them, and they opened the studio to other bands as a way to pay the bills. The list of bands that recorded at the old T.R.S. location- Keith's house- includes Rick DiBello, the Peens, Tri-Pod Jimmie, Guardian, the Generic Beat, and Blynde Dog, to name a few. They opened their new sixteen-track studio at 2617 Peach, Suite 203, in 1988, and charge $35 per hour to record bands. The studio occupies two rooms in an old public school building. The recording studio measures thirty feet by 28 feet, large enough to accommodate the sixty-member choir that recently recorded here. Veshecco said the room is bigger than the one at the Record Plant in New York City where John Lennon and Bruce Springsteen had recorded. The high ceiling at T.R.S. helps acoustically, said Veshecco. In the past year, Talon, T.H. Latona, the Ed Russell Trio and Marty O'Connor have recorded full-length albums at T.R.S. O'Connor's release is available on cassette and compact disc. In addition, three artists have recorded singles at T.R.S. : Knightwitch, the Change and Bob Guenther. Instruments are also available at T.R.S., including guitars, basses, guitar amplifiers, MIDI keyboards, a MIDI drum machine and drum kit. There is also a Macintosh computer for MIDI programs. The recording formats are one-quarter-inch and one-half-inch reel-to-reel tape. Veshecco said he wants to see where technology is headed before he moves up to a larger format. "What makes a good recording," said Veschecco, "is taking time getting things right." The performance, not the sound, is what makes the music sell. Band members are usually nervous when they first go into the studio. "The longer they're here, the more comfortable they are," he said. "So, it makes more sense to spend 100 hours in a $50 per-hour studio than spending fifty hours in a $100 per-hour studio. You can spend more time on a project and spend less money and still get a goo quality product." Dirty Looks signed on with Atlantic Records as a result of In Your Face, an album they recorded at T.R.S. and released on the independent Mirror Records. The basic track from the song "Can't Take My Eyes Off of You"(on the Cool From the Wire album), was recorded at T.R.S. and then remixed by Atlantic. "This proves that the quality we can deliver can make it to a national CD," said Vechecco. Henrik Ostergaard of Dirty Looks recommended T.R.S. "If you want to make good-sounding stuff at an affordable price, you should use T.R.S.," he said. "And if you want to release an LP, CD, or whatever, that's the place." I'm hoping that my niche will be bringing bands from the bigger cities here to record," said Veshecco of his future plans. T.R.S. is able to deliver finished cassettes and compact discs by working with outside pressing and duplicating sources. It can also duplicate small runs of cassettes in-house. "We can help people if they let us," said Veshecco. "If it isn't right, we won't accept a lower-quality level. Our name is on there, too." Veschecco and Mazza learned recording techniques on their own and through a course they took at Agency Recording Studio in Cleveland in the late seventies. 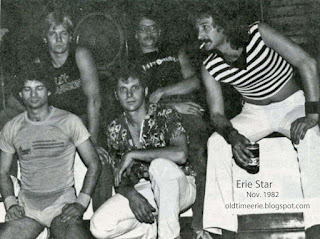 They also spent one month in Cleveland around that time working on the Clockwise album. Recording hours are flexible. "We try to cater by recording artists at their most comfortable time," said Veshecco. For rock groups, this usually translates to recording at night. -article ©Debbi Lyon 1990, 2012. The Wallace Bros. 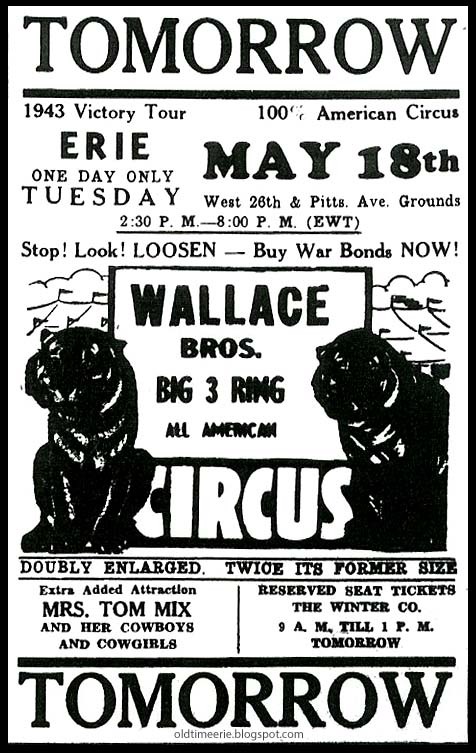 Circus' 1943 Victory Tour touched down at the fairgrounds at 26th & Pittsburgh Ave. in Erie, PA on May 18, 1943. This three-ring affair was billed as 100% American Circus and was twice its normal size. One of the added attractions was Mrs. Tom Mix and her cowboys and cowgirls. The circus poster featured a pair of tigers. Billboard magazine ran a teaser for the show in its May 1, 1943 issue: "The choice in town circus lots fell to the plough, the victory gardener and national defense. Not withstanding, Wallace Bros. Circus will play here May 18 on the Pittsburgh Avenue grounds, home of the former Erie fair and regular carnival grounds. County Commissioner Dell Darling, Erie's No. 1 fan, announced that the Ringling show will not be in this season, but that Cole Bros. may appear later. Regular city transportation is available to the Pittsburgh lot." The Pittsburgh Avenue site had direct access to the railroad. It encompasses the current site of Champion Ford, which was the former location of Super Duper West. Robert Hall Clothes opened at 420 East 26th Street in the mid-fifties. 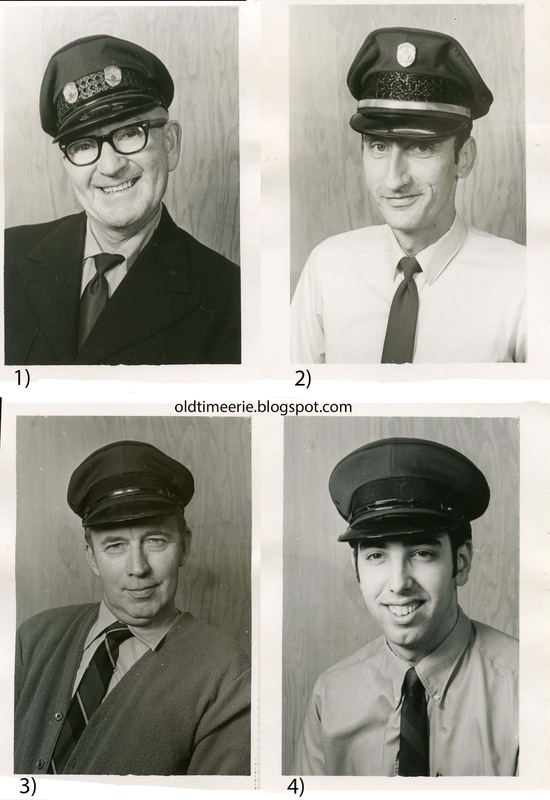 There were 162 Robert Hall stores in the U.S. in Sept. of 1953. By March of 1956, the number rose to 220 stores. Originally, the chain was a division of United Merchants and Manufacturers, Inc. The owners of Robert Hall filed for bankruptcy in 1977. Hofmann's Church and Religious Goods moved from 261 East 28th Street to the bigger store at 420 East 26th Street after Robert Hall closed. In 1967, Hofmann's was owned by Richard and Frances Hofmann. I am looking for a photo of Robert Hall on East 26th St., as well as other businesses in this block, from the late fifties or early sixties, taken by someone who lived in Erie. Most of the stores had a similar rectangular building design, so it would be easy to unknowingly mix up locations. Ad in Erie Morning News, June 27, 1959. "My dad said Richard Petty and his dad Lee both raced at the dirt track behind where the drive-in was on Iroquois Ave. That was in the fifties before Daytona," said Bill Ditch. Adam Nicholson and Joe Mobilia owned the Thunderbowl Speedway; Adam later bought out Joe's interest in the track. -Ad in the Erie Morning News, June 27, 1959. Ah-ha! Now you know where the sinners ended up after a Saturday night make-out session at the Star Drive-In Theatre. This ad cracked me up, so I thought I would share it with you. 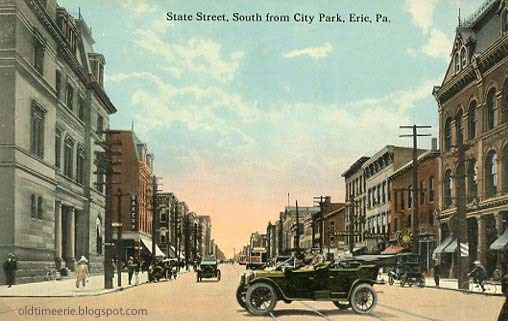 This postcard, taken on 12th and State Street in Erie, PA looking north, is courtesy of Ken Sidun. The Erie Trust Company Building on the right is better known as the Baldwin Building or the Renaissance Bldg. The Boston Store is visible in the distance on the left side of the image. The Sherman's sign was still hanging on the east side of State between 10th and 11th in the early seventies. You can also see the old Palace sign on the right. The area shown here on the right currently contains the Crooked I and the Docksider and the Plymouth. A portion of this postcard showing the Baldwin Building is visible in a shot from the early seventies. Ad in Erie Daily Times, June 15, 1951. Just an ad for now....looking for information. 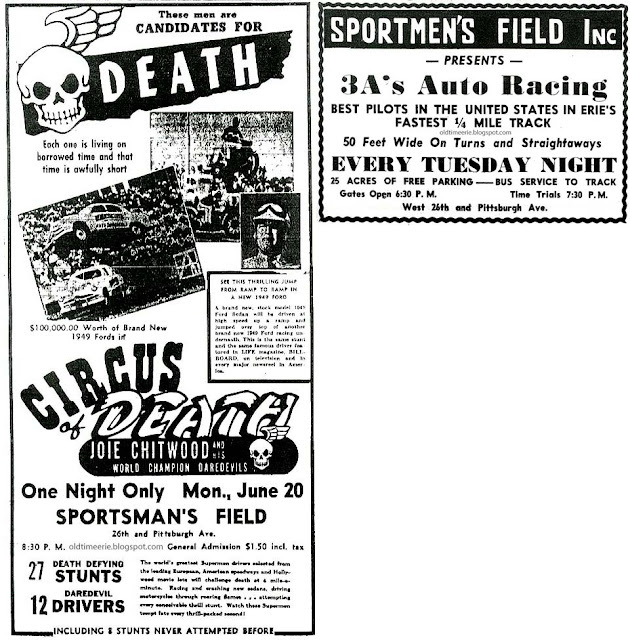 Ads in Erie Dispatch, June 19, 1949. 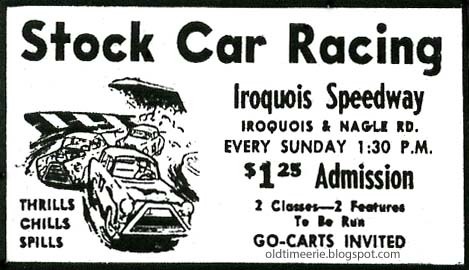 Before Interstate 79 was extended to the area near 26th and Pittsburgh Avenue, Sportsman's Field was the place to see daredevil car races on a quarter mile dirt track and professional wrestling matches. The field existed from 1949 until about 1952 and is now the site of an industrial park. Joie Chitwood and his World Champion Daredevils performed at Sportsman's Field on Monday, June 20th, 1949. The ad stated, "These men are candidates for death. Each one is living on borrowed time and that time is awfully short. See this thrilling jump from ramp to ramp in a new 1949 Ford...12 daredevil drivers...27 death defying stunts...The world's greatest Superman drivers selected from the leading European, American speedways and Hollywood movie lots will challenge death at a mile-a-minute. Racing and crashing new sedans, driving motorcycles through roaring flames...attempting every conceivable thrill stung. Watch these Supermen tempt fate every thrill-packed second!" Sportsmen's Field at 26th and Pittsburgh Avenue in Millcreek Township was a 1/4 mile dirt track, with 50 foot wide turns and straightaways. The field had 25 acres of free parking. This image, which is missing the Boston Store at 716 State Street, was taken around 1913 in Erie, PA. The photographer was standing in State Street near South Park Row, looking south. The old Federal Building, which was torn down in 1937 to make way for the new Federal Courthouse, is on the far left. The old Isaac Baker building at 629-633 State Street, which was destroyed by fire in 1943, is the reddish building next to the courthouse with the 'Baker's' sign. The red building across the street from Baker's to the south was later torn down for the new (now old) Erie Sport Store. 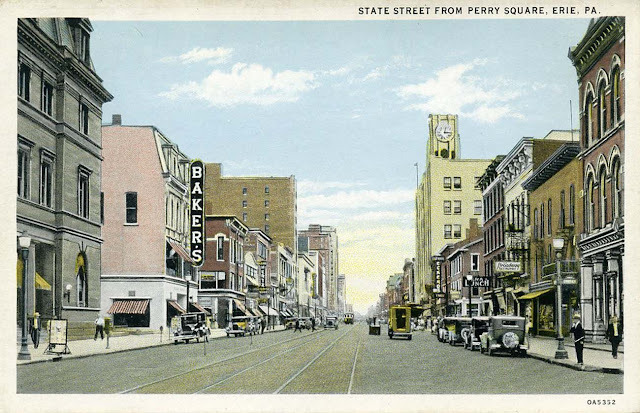 The trolley tracks down the middle of State Street were either torn out or paved over around 1935-36. 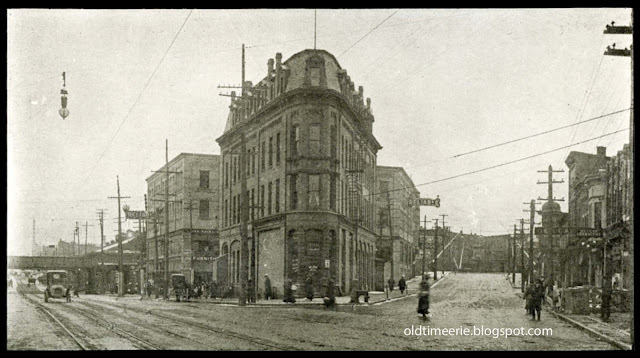 The old Elk's Club on the corner on the right side of the picture was torn down to make way for the new Erie City Hall, as were all the other buildings between South Park Row and West 7th Street on State. Chuck Eschweiler was a walking encyclopedia of rock music. I used to hang out and talk to him years ago when he worked at a record store at the Mall, back in the days when you could hang out with someone working retail, back in the days of record stores. I read his articles in the Erie Times-News Weekender and was forever picking his brain about how to get a foot in the door as a writer. His advice was something like "Stop talking about it and just do it." I also pestered his girlfriend Karen (later his wife and then ex-wife) who worked at Razzberry Records downtown. She was also very encouraging and didn't treat me like a thirteen year old kid. I took copies of articles that I wrote for our middle school newspaper for them to read and they would play the latest 45's by local bands for me. Chuck had a real sarcastic sense of humor. You either got him or you didn't. He struck me as being a loner but he seemed to absorb what was happening around him.. Chuck was born January 21, 1951 in Erie, PA. He died February 4, 2008 in Erie. The following article by Chuck Eschweiler was published in the Erie Times-News Weekender on June 9, 1979. I've been going to hear a lot of local bands lately, and am struck by the fact that most of them still think it's 1975. I know I'm not the only one, because I've heard a lot of people say that they wish this or that band would do some newer material. I don't know, buy maybe everyone's getting sick of hearing human jukeboxes playing something that sounds like it comes from some 'hip' FM station's playlist. Then again, there's the suburban cowboy brigade- most of whom have never lived closer to the Mason-Dixon line than Titusville, and yet posing as good ol' boys. Whatever it is, the success of the Frenchmen prove there is an audience for something new. As of this writing the Frenchmen have played out three times and already have a bigger following than several established area bands. The Frenchmen are John Drumm (keyboards and vocals); Bradley Harrington (bass and vocals); Dennis Johnson (guitar); and Fran Piazza (AKA Peachbloom Velour, on drums). People have associated the Frenchmen with punk rock and new wave bands because of Drumm's previous band, Pistol Whip. "The Frenchmen are not a punk band," John told me, "but they lumped everything that's come out in the past two years as that, or new wave, and those are over-used and worn out labels." "I don't know what we are," Bradley Harrington added, "but I know we're not punk rock, art rock, or country rock...Everybody says we are (new wave), but we don't have new wave pretensions and we're not out to impress any other musicians with any kind of musical direction." John and Bradley started putting the Frenchmen together last July, with the idea of appealing to a wider audience that Pistol Whip, and getting a band in which to do their own material. Bradley got Dennis Johnson out of retirement to join the Frenchmen, and they went through a series of drummers until someone gave them Peachbloom's name. "I had been in the Edinboro stage band," she said, "the George Fawcett trio, and an all-girl country band. I really wanted to play rock and roll, but I was apprehensive about it. Many girls can play as well as guys, but they're intimidated. I'd like to see any girl who can play drums, bass, or whatever be able to get out there and to it and not be self-conscious about it." Peachbloom has gotten over any apprehension she may have had, and the few people who have said, 'A girl drummer!' shut up as soon as she starts playing. She smashes into the drums with an energy so intense it looks dangerous. She is a perfect counterpart to the notoriously calm Johnson, who tears off frantic guitar lines and hardly blinks. The group's original "Cadillacette" is a crowd pleaser, as are most Frenchmen originals. The usual reaction to a band announcing they're going to do an original tune is for the ladies to go powder their noses and for guys to order from the bar. The Frenchmen are in the unique position of actually having people request originals. I've heard more than one person listen to an original and ask who did it, or what album it was from. The Frenchmen released two singles on Endangered Species Records in Erie, Pennsylvania. Xit, left to right: Doug Welser, Dal Hindson, Pat Monahan, Hans Hetz and Eric A. Christiansen. 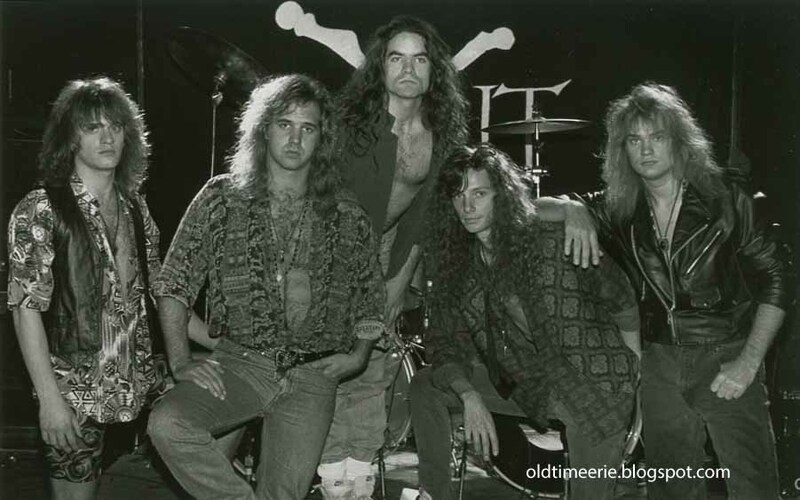 Take a close look at this photo and you will see Pat Monahan, bare-chested with long, flowing hair, smack dab in the middle. This picture was taken around 1990 or 1991 when Pat Monahan was the lead singer for Xit. In addition to Monahan, he band featured Dal Hindson on guitar, Eric Christiansen on keyboards, Doug Welser on drums and Hans Hetz on bass. They were residents of Erie, Pennsylvania and often headlined at Sherlock's. Xit relocated to California in search of brighter prospects after this picture was taken. An earlier incarnation of Xit had Jim Jowsey on lead vocals and Kevin Hultberg on bass. Doug Welser was in Damien Steele around 1985 or 1986. Pat Monahan graduated from McDowell High School in Millcreek Township. He was in Rogues Gallery prior to joining Xit. Patrick Monahan formed Train and the band signed to Columbia Records. They've won several Grammy awards and it's hard to turn on the radio and not hear a Train song. Hits include "Hey Soul Sister," "Calling All Angels" and "Marry Me." Pat also released a solo album called Last of Seven. Ad in Erie Daily Times, May 17, 1948. Ricardo's Tavern opened in May of 1948 at 2112 East Lake Road in Erie, PA. The restaurant is still in business at the same address. It was remodeled following a destructive fire, reopening in 2012. 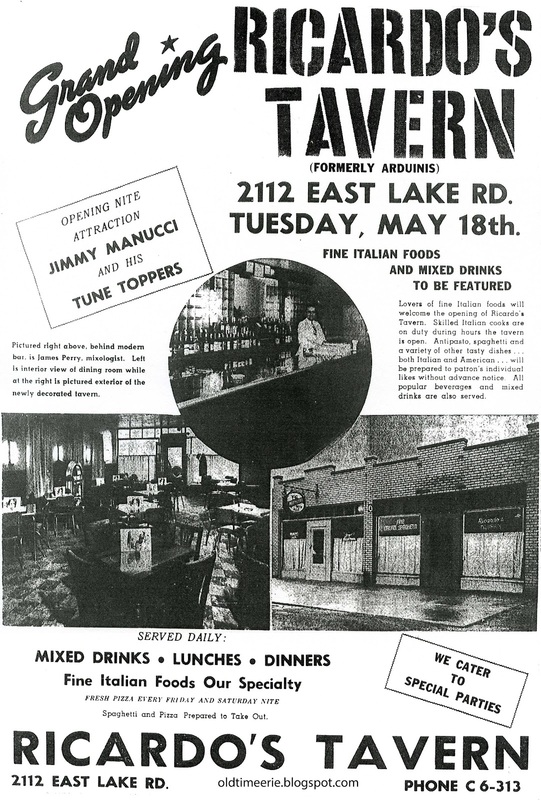 Jimmy Manucci and the Tune Toppers headlined the festivities on the opening night. "Lovers of fine Italian foods will welcome the opening of Ricardo's Tavern. Skilled Italian cooks are on duty during hours the tavern is open. Antipasto, spaghetti and a variety of other tasty dishes...both Italian and American...will be prepared to patron's individual likes without advance notice. All popular beverages and mixed drinks are also served." Ricardo's Tavern had fresh pizza every Friday and Saturday night. 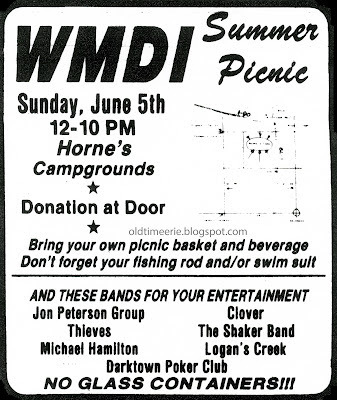 Ad in Erie Daily Times, June 4, 1977. 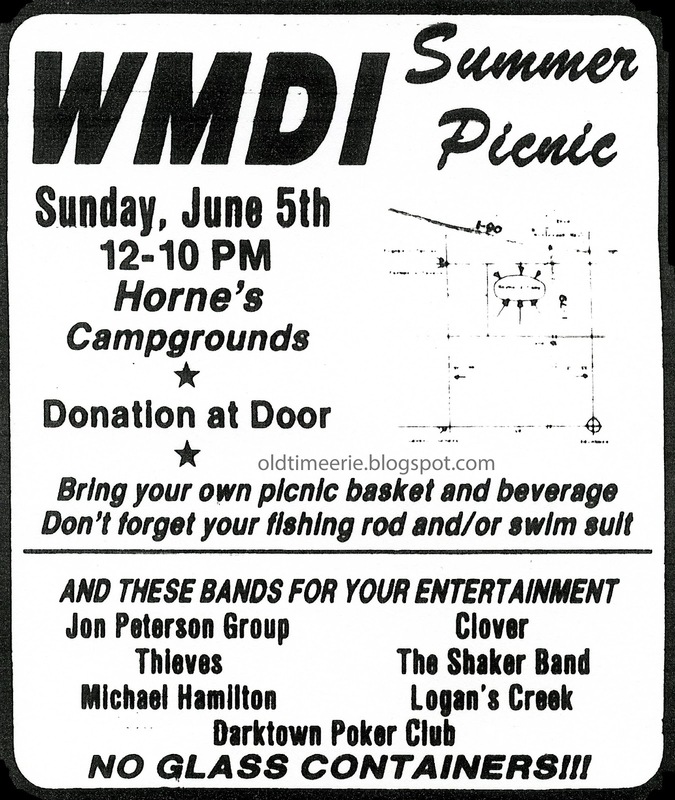 The WMDI-FM summer picnic was held June 5, 1977 at Horne's Campground. Dark Town Poker Club included Tom Buford, Gary Olson, Scott Anderson, Steve Bodie, Paul Matthews and Dan Bachmaier. The band released a self-titled album on Jeree Records which listed a contact address in Findley Lake, Chautauqua Co., NY. I will update this article as the men are identified. 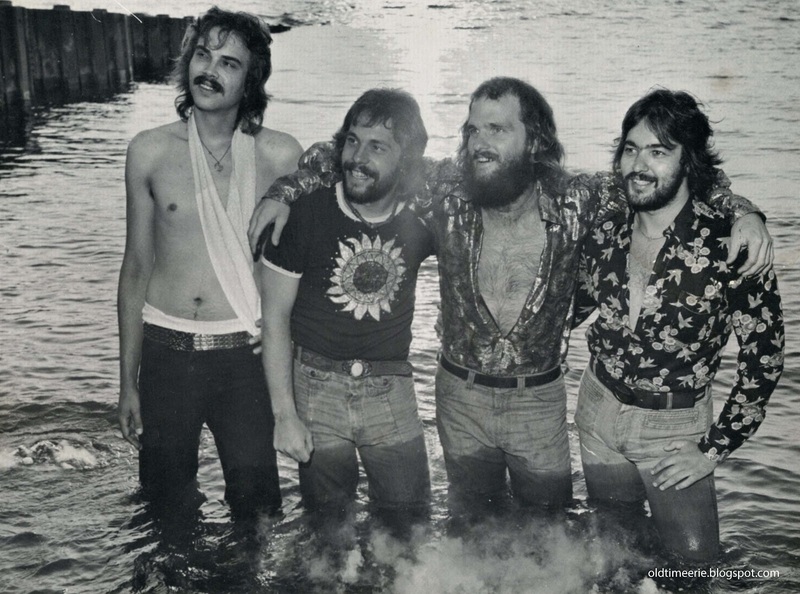 Vertical Union, left to right: Rick Andrews, Rick Urban, Larry Zurn and John Portonova. Photo courtesy of John Portonova. Bear with me while I gather information about Vertical Union...would you care to share your memories? For instance, what songs did the band perform? Where did you see them play in PA, OH, NY and WV? What do you remember most about their live show? C'mon, you can do it! Vertical Union played songs by Grand Funk Railroad, Cream, Styx and Iron Butterfly. 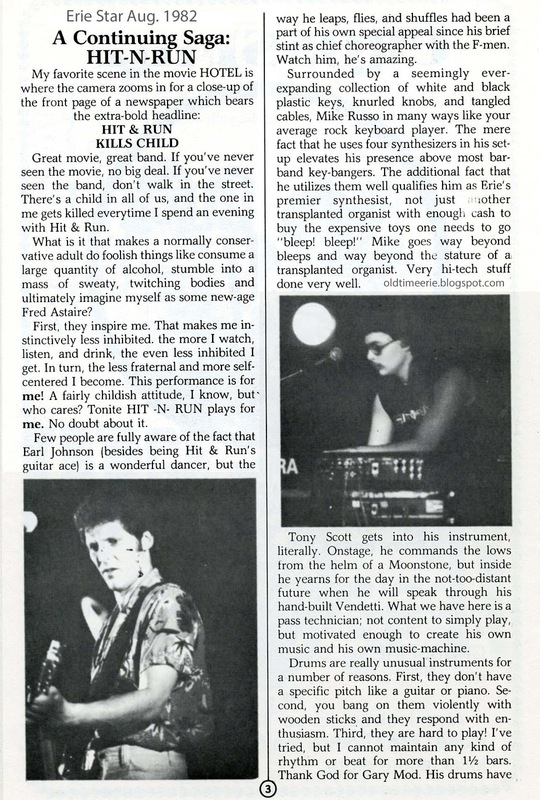 The band played at Anthony's, 12 East 5th Street in Erie, PA May 11-14, 1977. The new Johnny J. Jones Exposition, billed as the Mighty Monarch of the Tented World, played the circus grounds at 18th and Ash Street in Erie, Pennsylvania June 21 to June 26, 1948. 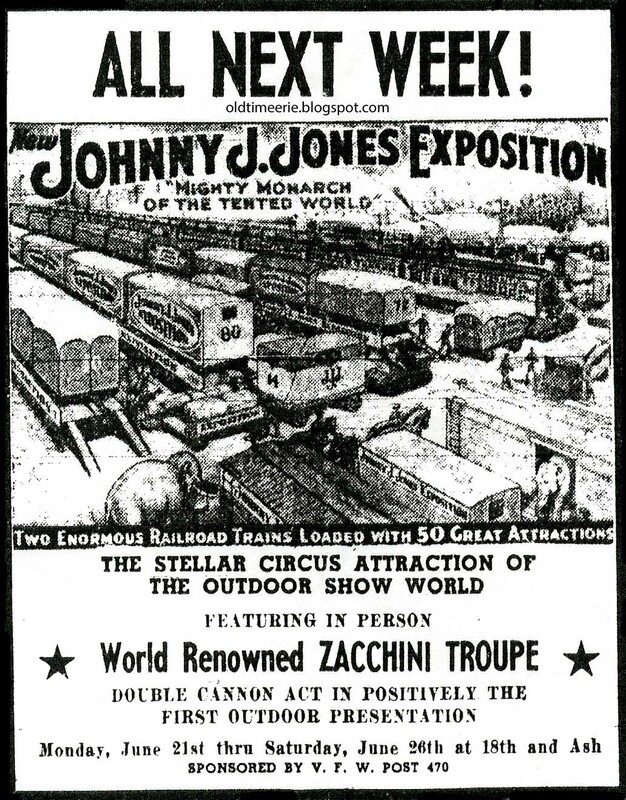 The newspaper ad, which was a black & white version of the circus poster, touted two enormous railroad trains loaded with 50 great attractions. "Patronage here was particularly gratifying to the org's co-owners, Morris Lipsky and Harold (Buddy) Paddock, inasmuch as there was plenty of opposition. Two name bands were in town, midget auto races were running, and Jimmie Lynch's Death Dodgers were in for a still date Friday Night (25). Moreover, the broadcasts of the Republican National Convention also served as a counter-attraction. Harvey Williams's midget show, comprised of nine midgets, including the Three Del Rios, joined on here, bowing Thursday night (24). The mechanism of the Bruno Zacchini cannon went haywire Monday night (21), and the gal 'projectile' sustained burns which forced the act to lay off for the remainder of the stand." The Cole Brothers Circus appeared at the Ash Street circus grounds in 1944. 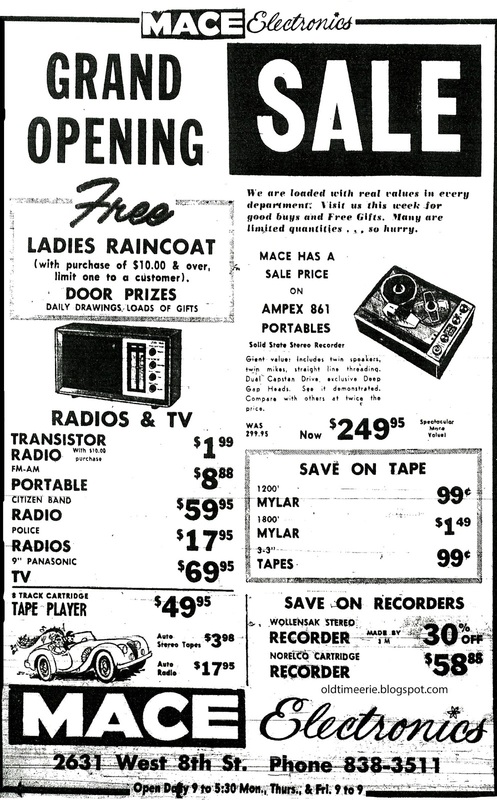 Mace Electronics at 2631 West 8th Street in Erie, Pennsylvania had its grand opening on Thursday, September 19, 1968. Customers who spent at least $10 in the store received a free ladies raincoat. You could save $50 off the price of an Ampex 861 portable reel to reel player, which was on sale for $249.95. Or you could pick up an 8-track player for $49.95. An AM-FM transistor radio sold for $1.99, and a portable Citizen Band CB was $8.88. "We are loaded with real values in every department. Visit us this week for good buys and Free Gifts. Many are limited quantities...so hurry," read the ad in the Erie Daily Times. Mace Electronics had a warehouse at 28 East 24th St. The business was owned by Mace Levin. I had a newspaper route from 1977 to 1979 which started at Slomski's Funeral Home, went down Ash Street to the railroad tracks, back up to East 21st Street and then went across 21st to Wayne Street and up Wayne and Reed to 22nd. I delivered to a motorcycle shop owned by Tech teacher Bernie Novotny and to Atkinson's Barbershop. 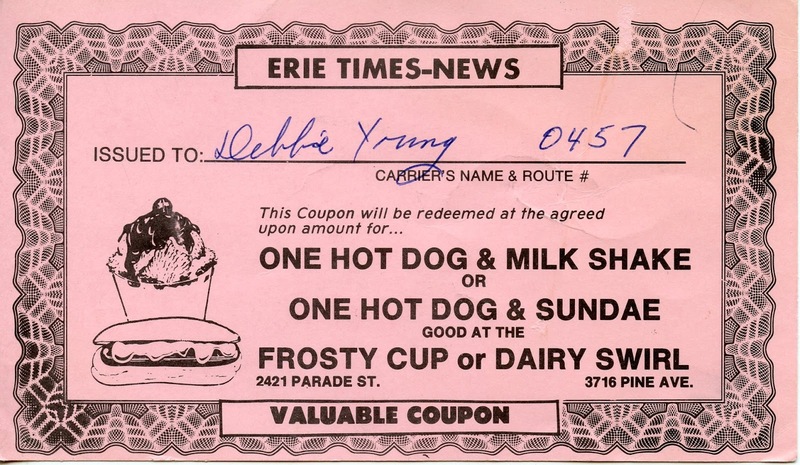 We used to get prizes for getting new "starts" such as the coupon pictured above. Prizes are great. Except when you forgot to cash in the coupons. Since there is no expiration date listed on the coupon, it should still be good, right? Well, they would be if the ice cream stands were not TORN DOWN. It seems like my sister Michelle and I went to Frosty Cup every day during the summer. I got a pint of vanilla ice cream. I'm not sure what she got. I delivered Route 0457 and my sister had 0455. We got our papers at the old fire hall on 23rd and Ash. Our District Manager was Danny Wagner. Years later, after I got married, I found out that Frosty Cup was owned by my husband's cousin, Kenny Wodecki. As they say, it's a small world. Erie County Public Library, Erie, PA. Photo by Chester Wasielewski. ©Debbi Lyon 2012. 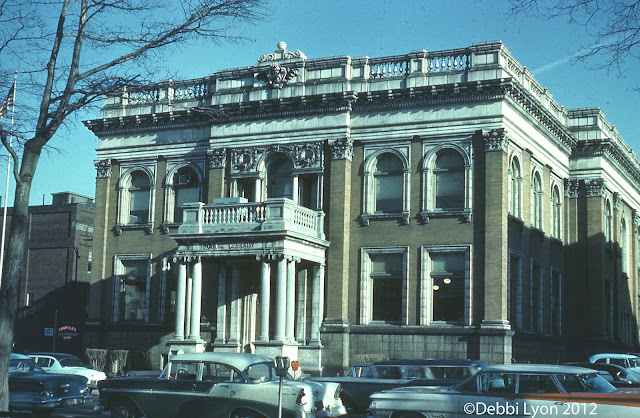 I spent many, many hours in the old public library at Perry Square in downtown Erie, Pennsylvania. This building is on the corner of South Park Row and French Street. It was dedicated on February 16, 1899. The building was renovated and is now part of the Federal Courthouse complex. The fiction room was on the first floor on the right side of the above photo. The Reference Room was on the left side. The Plavcan Art Gallery was in the center on the second floor. The Children's Room was in the basement. There is a neon sign for Canfield Auto Radiator Shop near the lower left corner. They were located at 623 French Street. The annual Friends of the Library book sale was held in the parking lot on the west side of the library, under a big tent. -ad in Erie Daily Times, May 27, 1941. 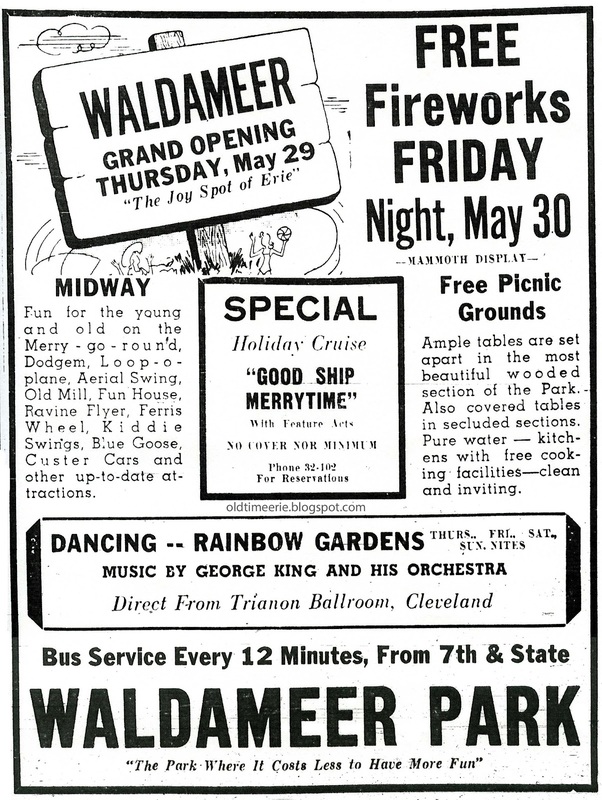 This ad from the Erie Daily Times was for the May 29, 1941 grand opening of "The Joy Spot of Erie." The Old Mill Run was replaced by Thunder River. The Ravine Flyer II replaced the old Ravine Flyer. The Sky Fighter is one of the older rides but it does not appear on the 1941 list. Waldameer Park is the top amusement park in northwestern Pennsylvania. The Erie Maennerchor was established December 12, 1871 in Erie, Pennsylvania, but this German heritage club was a long time in the making. "The lodge Harugari (in 1870) had a singing section, which was called Harugari Maennerchor. This was the nucleus from which the present day Erie Maennerchor was organized. The records of that time being lost, the only evidence remaining is the singing society's flag of the Erie Maennerchor...At that time still under the name of Harugari Maennerchor it speaks of John Schaefer, President, and Joseph Jungbluth, Secretary. At this time preparations were made to produce the operetta 'Fidelio.' Singers Eberle, Frank and Becker were the committee on management and the production was presented before an enthusiastic audience." -Our 100th Centennial 1871-1971 Erie Maennerchor. 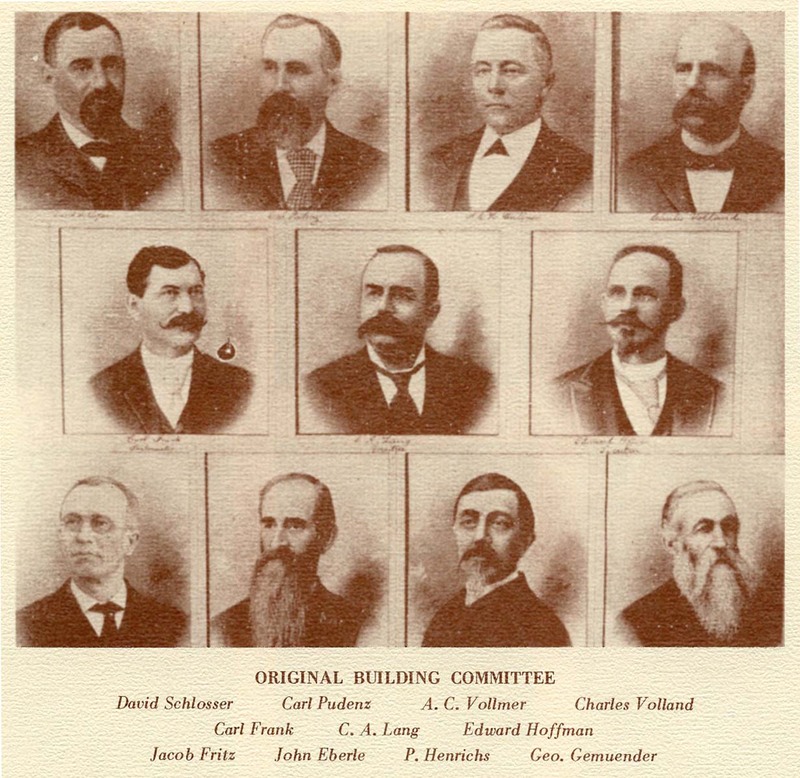 The building committee included David Schlosser, Carl Pudenz, A. C. Vollmer, Charles Volland, Carl Frank, C. A. Lang, Edward Hoffman, Jacob Fritz, John Eberle, P Henrichs and George Gemuender (Gemünder). George Gemünder pioneered high-quality violin making and trading in the United States. Thomas Baumert wrote a biography of Gemünder which appears on the Immigrant Entrepreneurship website of German-American business biographies. 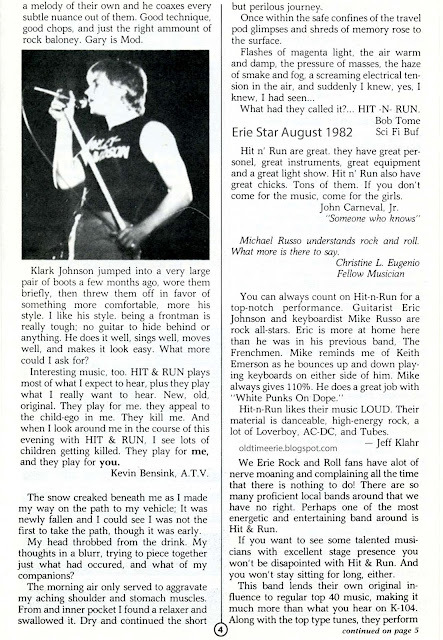 The Erie Star featured a lengthy article on theErie, PA band Hit & Run in August of 1982. The band at that time included guitarist Eric Johnson, keyboardist Mike Russo, bassist Tony Scott, drummer Gary Mod and lead singer Clark Johnson. A later version of Hit And Run included Mike Russo, Timothy Patrick McLaughlin, Keith Mazanowski and Hank B. (continued from page four)...some gutsy heavy metal tunes. I think true music fans would delight in hearing some new originals from this band. I certainly would enjoy a few! After all, Hit and Run is a sure crowd pleaser if the crowd feels like having fun, partying and booging." Cindi L. "A Rocker Who Knows"
This image of the Boston Store at 716 State Street was taken around 1932 in Erie, PA. The photographer was standing in State Street near South Park Row, looking south. The old Federal Building, which was torn down in 1937 to make way for the new Federal Courthouse, is on the far left. The old Isaac Baker building at 629-633 State Street, which was destroyed by fire in 1943, is the pink building next to the courthouse with the 'Baker's' sign. 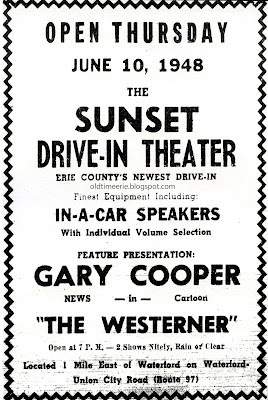 The Sunset Drive-In Theater made its debut on June 10, 1948. The outdoor movie theater was located one mile east of Waterford on State Route 97. 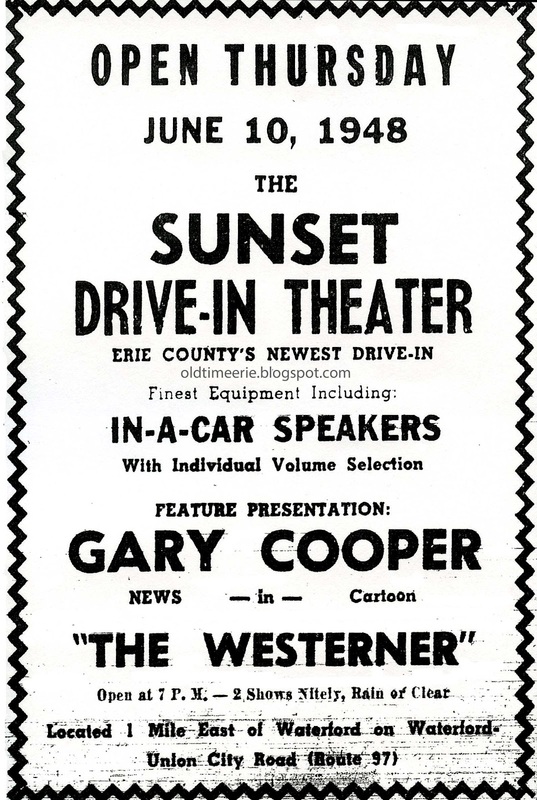 Sunset touted itself as Erie County, PA's newest drive-in, with the finest equipment including in-car speakers with individual volume selection. The theater had two shows nightly, rain or clear. Here's an article about the Peninsula Drive In Flea Market. #38 Gamma I'm Alive" features guitarist Ronnie Montrose and keyboardist Alan Fitzgerald, who both played with Sammy Hagar. #50 Survivor "Somewhere In America"Vocalist Jim Peterik had a hit as the lead singer of "Vehicle" by Ides of March. #102 Off Broadway "Stay In Time" Lead singer Cliff Johnson was in Pezband, another of my favorite bands. Great Chicago power pop. I must have played the Off Broadway album every day for a year. #79 Linda Ronstadt "How Do I Make You" I played this album a million times. A really good song, but there are better ones on the album. Linda was one of the first artists to play the new Tullio Arena on her "Get Closer" tour in 1983. #68 The Pulse "You Want To Know Why." 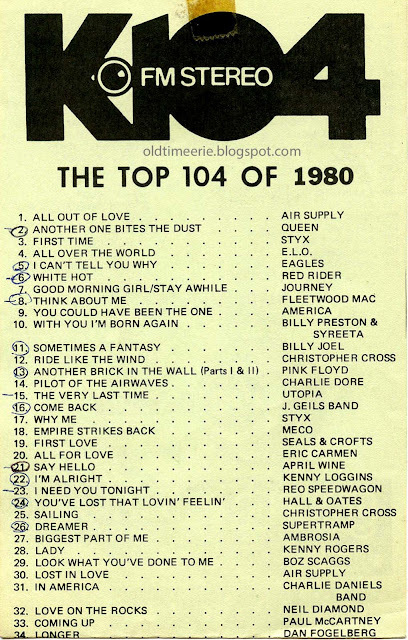 Did you miss Numbers 1-34 of the Top 104 of 1980? Want to read about the Commerce Building, the former home of K-104? The K-104 year end Top 104 was a big event for the teenagers of Erie. If I remember correctly, songs were counted down in reverse order, starting at #104, which was "She's Out Of My Life" by Michael Jackson. I had several cassette tapes ready to record my favorite songs (which did not include any Michael Jackson). This list hung on my bedroom wall for a long time. One local band- The Pulse- appeared on the list at #68 with "You Want To Know Why." http://www.youtube.com/watch?v=jhEGajjCvFw The band included Bob Burger, Jeff Burger, Marty Lee and Jeff 'Tune' Klahr. I drive past the old Mid-City Golf Range several times a week and I still wonder why it closed. 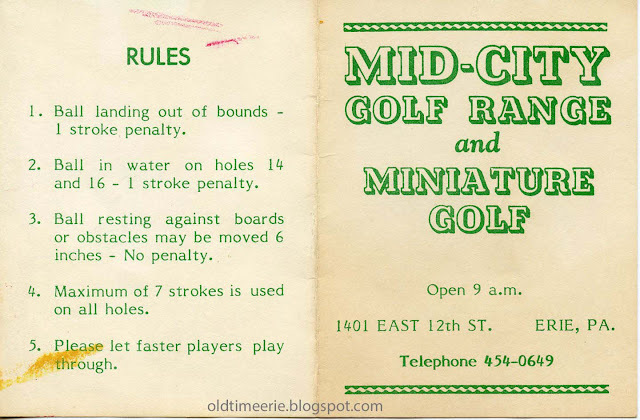 I used to go there all the time in the early eighties to play miniature golf or hit a few balls in the batting cages. It was also fun to watch the guy drive around in a caged-in vehicle sweeping up golf balls from the field. Which remains an empty field to this day. I think the lot at 1401 East 12th Street was supposed to be part of an industrial park, but so far nothing has been developed there. Par at Mid-City miniature golf course was 41. We also played miniature golf at Putt-Putt on Buffalo Road in Harborcreek and the one on 12th and Peninsula Drive in Millcreek Township. They are all gone.